We have written a lot about the new generation of hotspots coming out this year that will make it snap for your smartphone to connect seamlessly to your mobile operator’s Wi-Fi hotspots. But what about hotspots that your carrier doesn’t manage? It turns out the world of Wi-Fi roaming is a whole new bag of problems — problems global wireless standards bodies vowed on Tuesday to solve. If Wi-Fi is really to going to be going to be a key component of mobile broadband networks, operators need to figure out how to get dozens if not hundreds of disparate Wi-Fi networks to interoperate. Otherwise operators won’t be able to take advantage of the tremendous economies of scale gained by sharing Wi-Fi infrastructure. An operator like AT&T(s t) could vastly extend its already considerable Wi-Fi reach by partnering with a hotspot provider like Boingo(s wifi) or tapping into the huge hotel networks offered by Hilton, but if you have to log in and authenticate your device to each new hotspot then such partnerships are pointless. The GSM Association and the Wireless Broadband Alliance are trying to tackle that issue by merging the mobile and Wi-Fi industries’ two roaming frameworks. In the mobile world it’s called the GPRS Roaming Exchange, or GRX, while in the Wi-Fi it’s known as the Wireless Roaming Intermediary Exchange, or WRIX. Separately GRX and WRIX are great at handling the myriad of roaming arrangements between mobile operators and between Wi-Fi hotspot providers, but today there’s no crossover, said Dan Warren, director of technology for the GSMA. By mashing together the two exchange frameworks, the GSMA and WBA hope to create a set of protocols and commercial agreements that will allow any mobile device to automatically log into any Wi-Fi access point so long as the mobile operator and hotspot owner have a business relationship. The common ID will be the SIM card. Building that common framework, however, will take time considering the hundreds of mobile and hotspot service providers involved. 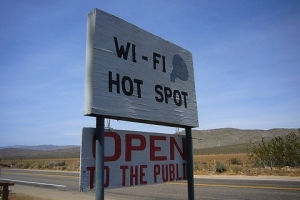 So while the Wi-Fi Alliance will start certifying the first Hotspot 2.0 devices in July under its Passport Passpoint program and the first next-generation access points will be available in late 2012, the roaming frameworks won’t be in place until 2013, Warren said. This is the most bass-ackwards ‘standardization’ possible. WiFi works now globally, far better than any carrier network. You get access by just connecting to an open network, or by finding a password for a closed one. If you’re really unlucky, you get a pseudo-open network that puts you into a non-internet connected blackhole until you open a browser and frob with it for a while, or fill in a form or some such broken thing. That last situation is the bit the carriers have contributed – a fake network purporting to be the internet, that annoys everyone trying to use it. Smart companies have open networks. Smarter ones sponsor open networks in public places so people can avoid these broken pseudo-networks the carriers impose. Stupid companies pay the carriers to set up these broken ones in the hopes of a revenue share. anon is on the right path. Aside from some international business users with Boingo, who really thinks about “Wi-Fi roaming” today? You just think about Wi-Fi access. Trying to shoehorn public wi-fi access into a cellular subscription model is not going to go well. For Hotspot 2.0 authentication, we need to be conceptualizing new architectures that are more open and scaleable than cell HLR/HSS constructs. In-Stat is predicting 120B hotspot connections in 2015. If half of those happen over HS2 infrastructure that’s about 2000 auths/second that are being routed and cleared somewhere. And where do the small and independent hotspot operators play in all of this? Note that EAP-SIM is just one auth method supported in Hotspot 2.0. It also will support EAP-AKA (USIM), EAP-TLS (certificates) and EAP-TTLS (user/pass w/server cert). wifi is very often free today, and not tied any subscription. all these business relationships means that’s less likely to continue. This would work in cablevisions favor. They have a wifi network that they are trying to get to cover their whole service area. They are also working on a wfi /cell backup phone service. If this goes through it will help them greatly with this service. And, once upon a time, there were cellular networks, operated by different carriers, specific to each of the major (and minor) companies. And individual companies today are proclaiming that they have the widest coverage. How much longer will it be in the public interest that the networks are combined instead of being based on corporate greed?